Toxic Mold can be found almost anywhere; it can grow on virtually any organic substance, as long as moisture and oxygen are present. There are molds that can grow on wood, paper, carpet and insulation. When excessive moisture builds up and accumulates in building materials, mold growth will occur. Particularly, if the moisture problem remains undiscovered or unaddressed. The best method of controlling it is to control moisture. If mold growth goes unchecked, it can cause serious illnesses. Lawsuits in California and Texas contend that mold exposure has led to serious illness and death. Another example of the public awareness and valid concern was documented on “48Hours” and “Today” where it was reported the claims of severe physical and mental illness resulting from mold infestations. Many Americans are nervously inspecting their mail for anthrax since the September 11 devastation, the U.S. Environmental Protection Agency (EPA) urges the public to remain on guard against another toxic substance: MOLD- STACHYBOTRYS CHARTARUM. The EPA reports that there is an association between Stachybotrys Chartarum and illnesses observed. Throughout the United States you will see the rise of public plea with insurance companies to correct water damage to prevent the deadly mold from sporing within their homes. 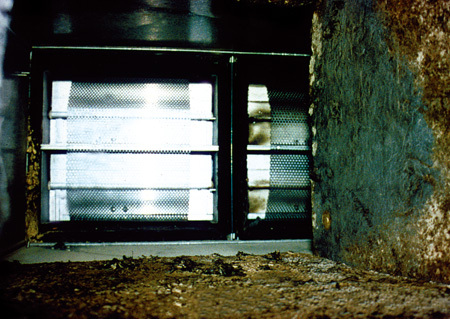 SBS (sick building syndrome) occurs when the air-handling systems have become contaminated, re-circulating toxic air. Building occupants experience health ailments that appear to be linked to presence within the building. TOXIC MOLD may be growing in your home. Have you had a previous flood? A plumbing problem or a roof leak? Are your windows leaking? Do you have an improperly working exhaust vents …in the bathroom? The kitchen or laundry room? Wet areas that have not been properly repaired are the foundation for breeding toxic molds such as Stachybotrys C. If you have toxic mold, DO NOT TOUCH IT …proper handling is essential for everyone’s safety. Stachtbotrys (Black Mold) is a greenish –black mold that grows on materials with a high cellulose and low nitrogen content, such as: fiberboard, gypsum board, paper, dust and lint. Growth happens when there is moisture from water damage, water leaks, condensation, excessive humidity, water infiltration or flooding. 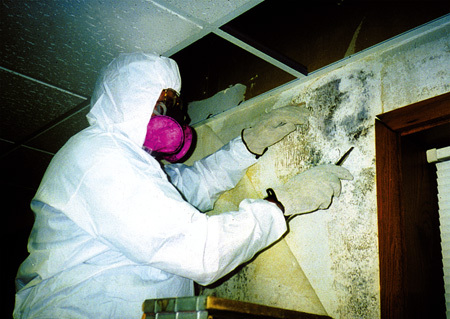 This particular mold growth occurs widely in the United States, it is very common to find is residential and commercial properties. When it is wet it looks black and slimy sometimes with white edges, however, when it is dry it looks shiny. 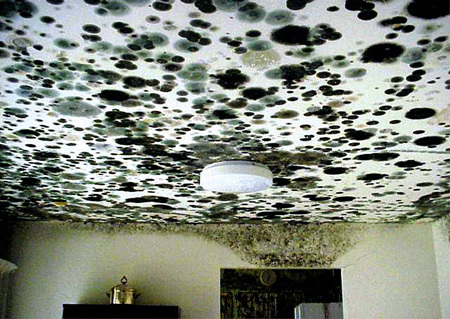 If you suspect this mold do not touch it, call a professional remediation service- call us C.A.S.I..
Black mold is toxic. If it is disturbed and not contained it becomes airborne, then the risk of respiratory exposure goes up. You never want to attempt to remove the contaminated area. IT IS ESSENTIAL FOR YOUR HEALTH to call a remediation specialist who has been fully trained in black mold. PPE (protective personal equipment) is an absolute necessity when handling this toxic mold. 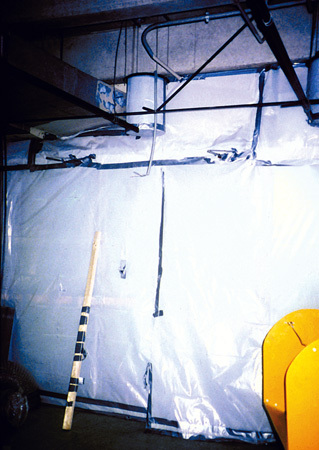 Containment during remediation is necessary to limit release of mold into the air and surroundings, in order to minimize the exposure of specialists and building occupants. Mold should not be allowed to spread to other areas in the building or home beyond the contaminated site. When you are contemplating the clean up of black mold, you must verify the extent of the problem. You never want to touch the contaminated spot or attempt to remove it. A professional trained in mold remediation from C.A.S.I., will be glad to assist with the problem. Severe respiratory health risks and even death are associated with this toxic, deadly mold. All indoor mold growth is potentially harmful and should be removed promptly, no matter what types of mold is present or whether it can produce toxins. According to the CDC, toxic mold is a common cause for school closings. If a school board selects to go through to eradicate the problem, individuals need to be just as cautious within their homes. C.A.S.I. will investigate/evaluate and remediate all contaminated areas. It is important to do routine mold checks as part of regular maintenance on a commercial building or a residence. Prevention is a key factor in eliminating spontaneous growth of this toxic mold. Evaluation of the site is imperative in the remediation process as it allows us to appropriately and safely remove the toxic mold. Black Mold must be removed by a trained and qualified professional, using the following procedures. Level I: If the contaminated area is 2 square feet or less. A)	The area can be cleaned by individuals who have received training on proper clean up methods, protection and potential health hazards. These individuals should be free from asthma, allergy and immune disorders. At a minimum, Gloves and a half face respirator should be worn at all times. B)	Contaminated material should be placed in a sealed plastic bag before taking it out of the building. This will prevent contamination of other parts of the building. C) Surrounding areas should be cleaned with a household bleach solution. Level II: If the area of mold is more than 2 square feet but less than 30 square feet. The recommendations are the same as Level I, with the added precaution that moldy materials should be covered with plastic sheets and taped before any handling or removal is done. Level III: If the area of mold is more than 30 square feet. Trained professionals in mold remediation are positively a necessity. Level IV: If mold is shown to be present in the heating, ventilation, or air conditioning system. Recommendations are the same as Level III. This information is for people who have mold problems in their homes. It presents the health concerns associated with mold exposure and advice on finding and removing mold contamination. The Minnesota Department of Health does not recommend testing for mold. Instead, you should simply assume there is a problem whenever you see mold or smell mold odors. 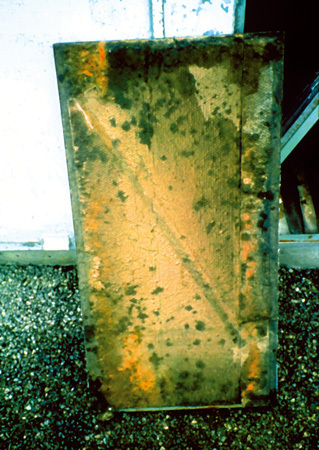 Testing should never take the place of visual inspection and it should never use up resources that are needed to correct moisture problems and remove all visible growth. To clean up and remove indoor mold growth, follow these steps as they apply to your home. Disinfect Surfaces (if desired) - after cleaning has removed all visible mold and other soiling from contaminated surfaces, a disinfectant may be used to kill mold missed by the cleaning. In the case of sewage contamination, disinfection must be performed. Contact the Minnesota Department of Health for appropriate advice. Always handle bleach with caution.Never mix bleach with ammonia — toxic chlorine gas may result. Bleach can irritate the eyes, nose, throat, and skin. Provide fresh air (for example, open a window or door). Protect skin and eyes from contact with bleach. Test solution on a small area before treatment, since bleach is very corrosive and may damage some materials. Rebuilding and refurnishing must wait until all affected materials have dried completely. Be patient it takes time to dry out wet building materials. A moisture meter may help measure drying progress. Contact your county Extension Service office to see if they loan moisture meters. Some air cleaners are designed to produce ozone which is a strong oxidizing agent and a known irritant of the lungs and respiratory system . Studies have shown that ozone, even at high concentrations, is not effective at killing airborne mold or surface mold contamination. Even if mold was killed by ozone, the health threats would not be reduced until mold contaminants are removed through cleaning. Health experts, do not recommend the use of ozone to address mold or any other indoor air problems.